Welcome to the Aquatic Turtle Cleanup superstore! Aquatic turtles make great pets; they are fun to watch, simple to care for, and about as cute as a reptile can get. However, one drawback is that they don't have the best cleaning habits. Like many aquatic critters, pet turtles produce waste and organic material that will gradually make their habitats turn rather foul. Without regular cleaning of your turtle's terrarium, it can quickly become unpleasant for you to look at and smell, and unhealthy for your turtle to live in. 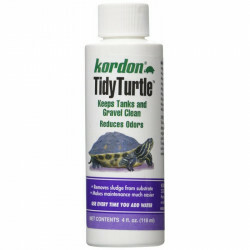 Our line of aquatic turtle cleaning supplies has what you need to get your pet's home back on track. Pet Mountain's Aquatic Turtle Cleanup store features top quality products from the most trusted names in aquatic turtle care and terrarium maintenance, including Natural Chemistry and Zoo Med. Natural Chemistry Healthy Habitat Cleaner and Deodorizer is specifically formulated to effectively eliminate odors and soiling caused by organic animal and food waste. For use in any pet habitat, glass and other surfaces within habitat, i.e. : heat rocks, gravel, artificial plants etc. This solution is safe for use on all strong animal/reptile odor sources and stains, can even be used when pet is in its habitat! 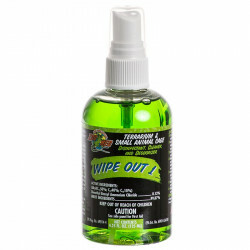 Zoo Med Wipe Out 1 Terrarium Cleaner is a small animal cage disinfectant, cleaner and deodorizer. 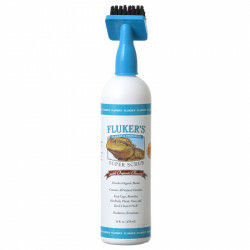 It is ideal for cleaning, disinfecting and deodorizing terrariums and other animal enclosures. Kill dangerous germs on contact! 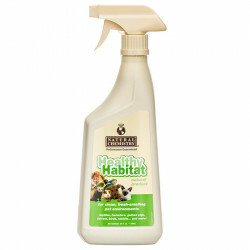 This liquid spray is a disinfectant, cleaner and deodorizer that kills microbes in terrariums and small animal cages. It kills a broad spectrum of bacteria, including salmonella choleraesuis and pseudomonas aeruginosa. Zoo Med Black Silicone Rubber can be used for terrarium repair and aquarium repair. You can use it to attach backgrounds, ledges, plastic plants or vines in naturalistic terrariums. Also great for repairing leaks in terrariums or aquariums!